"I'm almost there." Daniel Greene shouted into his phone over the pouring rain. He threw into the passenger seat in his truck. The man tore down the old back road that lead to his horse barn, Greene Hills Farm. 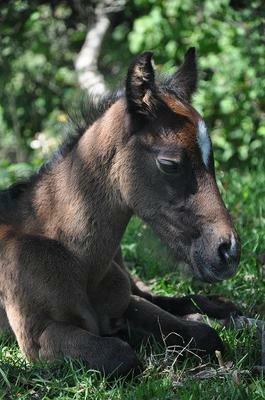 He had a new Thoroughbred foal just born. The man pulled his silver truck into the puddling drive way and dashed to the barn. Daniel threw the door open as dry lightning split the sky, and closed it behind him. He gasped. "Dan, over here! You won't believe it!" Rusty, his childhood friend chuckled, waving his red ball cap. Daniel combed his right hand through his thick, shot black hair. "Better be a good one Russ, or it wasn't worth waking up for." He growled. Excitement and fear coursed through his veins. Was it really worth the go? He gazed into the stall. A small colt was wobbling on stilts. Daniel's face went blank. His jaw dropped. The man turned on his heel. "Ah, Rusty." Daniel said through his hands in a muffled voice. "I'll buy 'im for five thousand flat." Rusty said. "No Rusty! He's perfect!" Daniel hollered. Horses turned their sleepy heads. He's unbolted the stall door and walked in, letting the mare check him over. "You did a mighty fine job, Stare." He said, petting the mare's chestnut neck. He placed a hand on the nursing foal's back. It jumped and wobbled quickly to the other side. Stare nudged the man. Daniel chuckled. "Well, what'cha gonna name the colt?" Rusty asked, rubbing his eye. "Storm? Lightning? Thunder?" "Too common Rusty. Something good. Good for a race horse." Daniel mumbled, rubbing his chin. Rusty almost choked on his own spit. "Race horse? Daniel you've got to be kiddin' me! He's only a colt born five minutes ago." "That's why wanted this foal in the first place, you idiot!" Daniel growled. "Geez." Rusty said as he swatted a lazy fly with his hat. "It's a perfect name for a race horse. I can feel his power." "I bet!" Rusty leaned over to cough from laughing so hard. "I don't see how it's so funny!" Thunder screamed as wind shoved against the barn, shaking it. Horse neighed loudly and kicked the stalls. "Easy..." Daniel reassured his horses. The colt then rammed his head into the man's leg, making him fall into a pile of straw. The men laughed as A Dear John's letter whinnied loudly.